What are the best authentic restaurants in Barcelona? That’s a question I’m often asked by my clients. However, many times they are not ready to go too far from the city center for dinner… In that case, I’d just recommend a few local places where locals and tourist mingle, but not really a 100% local place. Because let’s assume that: with the Internet it has become almost impossible to hide the good places from visitors, unless you are ready to go outside of your comfort zone! But if you don’t mind entering the local districts, today you’ll love our post about authentic non touristy places to eat in Barcelona. Located in a quiet hidden plaza in the formerly industrial district of Poblenou, this old-fashioned traditional Catalan restaurant specializes in fish and seafood. If you are an adventurous eater, the octopus plate and the eel rice will make your day. If by “best” you understand “finest”, this venue is both “best” and “authentic” because it mixes up fine cuisine with an authentic local story: here is where one of the local conservative political local leaders was spied by private detectives hired by her competitors. The case is still in court… Double check there are no mics hidden in the flowerpot over your table! From all the non touristy places to eat in Barcelona, this one is surprisingly close to Park Güell. Being the opposite direction that the tourist crowds take to get to the Park, locals instead pilgrim to this family-owned tapas bar to order plates of their famous patatas bravas. Make sure to arrive early, otherwise you’ll be joining the line of hungry customers by the door waiting for a table. For a more informal experience and to find good cheap food in Barcelona, in one of their most liveliest plazas Quimet d’Horta has been open for over 85 years. 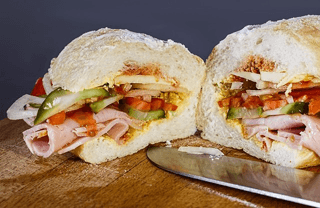 Although they serve tapas and salads, they are really famous for their ciabatta sandwiches. Choose one of their sausage or their omelet choices to blend in with the local crowd. In my list of the best authentic restaurants in Barcelona, we couldn’t miss an old-school choice. This restaurant has been open since 1975 in this old farm-house building in the heart of the classy neighborhood of Sarrià. Order one of their famous rices or any of their other Catalan dishes: the food to eat in Barcelona! Authentic traditional tavern in the Poblesec district with chariot wheels decoration and earthy Spanish and Catalan cuisine. Are you ready to try rabbit? If not, go for the garlicky potatoes and the chicken. Do you like going off the beaten path? Share your favorite non touristy places to eat in Barcelona on a comment below!